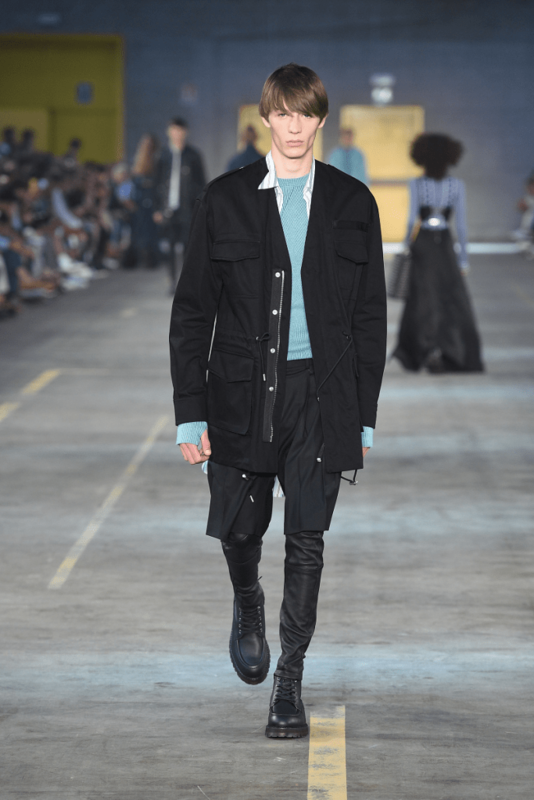 Diesel Black Gold embraces a street-wise sensibility for its first co-ed runway show. Creative director Andres Melbostad mixed a strong urban aesthetic with athletic references to convey a new “Techno-Grunge” attitude. This informs both the women’s and men’s collections, which reflect the line’s signature utilitarian spirit elevated this season to street cool. Multiple layers define the silhouettes, which are mainly lean and elongated in the women’s range, while proportions are exaggerated in the men’s lineup. Watery tones of aqua, mint and turquoise inject a fresh, breezy feel into the collections, where contrast stitching and drawstrings introduce accents of color. A Nineties’ feel runs through the women’s collection. Maxi slip dresses reveal a combination of micro floral motifs, while the front-button long dresses, coming in a patchwork of plaid patterns, are worn over fluid skirts and skin-tight pants with surf-inspired graphic inserts. Long cardigans are layered on crop tops and suede skirts with buttons on the front. Fitted striped knits are worn under dresses and camisoles paired with baggy pleated pants showing a sartorial feel. Zippers and drawstrings give a functional attitude to denim and windbreaker nylon dresses. Core men’s staples are re-proportioned and abstracted. Plaid shirts in aqua tones are cut extra long and are matched with shorts layered over leggings for an athletic-inspired look. A parka and a hoodie are combined in leather short-sleeved hybrid jackets, while an elongated anorak crafted from a shirting fabric is layered under a cropped cotton bomber. The sharp cut of a collarless coat is exalted color: #000000;by the constructed big shoulders and sartorial blazers are worn with sporty tops. Pants, crafted from lightweight nylon and denim, are cut extra baggy or super fitted. Their colored contrasting stitches echo surf wetsuits. Accessories include women’s laced-up suede flat sandals, as well as men’s shoes with chunky soles and hiking boots, all injected with an urban-combat mood. In the Philippines, Diesel is exclusively distributed by Stores Specialists, Inc., and is located at Greenbelt 3 and Power Plant Mall. Follow @ssilifeph on Instagram for more information.